Led by industry experts from Blizzard, Disney, Pixar, Ubisoft, and Microsoft, DeepMotion leverages the latest in AI technology and robotic control theory, allowing users to instantaneously animate their emojis simply by moving in front of the phone’s camera. With DeepMotion’s Digital Avatar simulation, users will now be able to use their body to express themselves more fully. The new technology will bring body language to emoji communications, which to date have been limited to facial expressions and simple head movements. Users can now capture body movement using the rear camera, or upper body movement using the front-facing camera. More here, another video below. The demo video leaves me a bit confused as to how the avatar interacts on the phone itself -- in an app, or on the default screen, or what -- but if the real time motion capture works as well as represented, I'm impressed. And plan to check this out in person next week at GDC. "I wish people knew how much it hurt to see the flag on TV and in places which are supposed to represent everyone in a fair manner, like court houses. I have been to places in Second Life which had the flag up... We always knew what it meant. That we and others with our color are not wanted around that area. It is like putting up a 'Caucasian only' sign. I have a lot of bad memories with that flag. Like walking past homes of people who have them proudly displayed in front of their homes... while at the same time, the mean stares we got just for walking by their home." I convinced a couple other friends of mine who are Black to join SL back in 2007, but they were disappointed in the quality and variety of black skins back then and left the game. It’s true, most skins were shades of bronze, and a deep ebony like this one would be hard to find. I love the way the highlights define this picture so powerfully, the highlights on her hair, her face, and her top. A skin designer told me back then that the reason skinners didn’t make dark black skins is that people didn’t buy them and people didn’t buy them because they didn’t know how to photograph them. If you aren't black, the luxury of throwing on a black skin and playing black should make you think about why you want to do that. Do you know black peoples IRL? Do you think they would be ok with what you do in SL? Do you actively call out the racist thoughts and behavior people have towards a black person, or do you just [say] "LOL I'm white"? Do you think it's cool to be black, but IRL you engage in black shaming, like saying things are "ghetto" or "hood"? Lee gathered 56 study participants — half identifying as white and half identifying as black. She then had them read a fabricated magazine story titled “Meet the Coolest ‘Second Life’ Residents.” The eight “Second Life” avatars profiled in the story were either all white, in the low-diversity scenario, or an equal mix of white, black, Hispanic and Asian, in the high-diversity scenario. 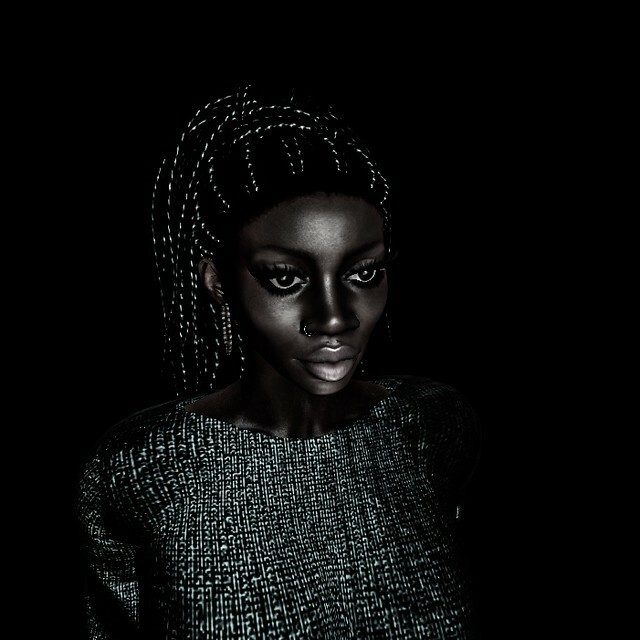 She then had them perform two tasks: Create and customize their own virtual avatars, and rate their willingness to reveal their real racial identity through the appearance of their virtual avatar. She found that black participants reported less willingness in the low-diversity scenario, and that they also created whiter avatars, as judged by objective raters. And I found out that you can, indeed, leave your SL avatars to other people when you die. Linden Lab actually has a process and procedures in place, to deal with just that possibility. Which leads me to my next point. Simply put, I need to figure out who gets what avatars when I die. So he is doing just that now, asking for people to contact him and volunteer to take his avatars into their care, whenever the time comes for his will to be read. "I will NOT be giving any avatars to anybody that I do NOT know, or with whom I have NOT had at least one good, long, in-depth conversation," as Ryan puts it to me with emphasis. "I do want to know who you are (and what you plan to do with my avatar) before I leave you one of these avatars, on which I have spent a great deal of time, energy, and (in some cases) money." Breast Veins & Stretch Marks are a new accessory for Second Life avatars, created by Izzie Button, whose Cellulite & Stretch Marks for female avatars have become an unexpected hit. "After the release of the cellulite/stretch marks," Izzie tells me, "the response was huge and many people requested stretch marks on breasts, arms, stomach as well, so I made them. " She had planned on creating them before the cellulite/stretch marks went on sale. "I was just waiting to see how the response would be before I release more of something that nobody wants," she says, laughing. "I'm glad people enjoy them." There's a hot new avatar fashion enhancement in the virtual world of Second Life, but it's more real than many might expect. Ever since creator Izzie Button put her Cellulite & Stretch Marks for female avatars on sale last week, they've been moving like mad. "Sales have been really good," she tells me, "a lot better than expected to be honest. On SL Marketplace, it is my #1 best selling item now, with four 5-star reviews in only 1 day. I've gotten mainly positive feedback from customers about them and lots of requests to do more stretch marks/cellulite on other body parts too." It was women in the main, who broke this feedback loop. When they saw that the slider now said 7 feet plus they started to reduce. Their men began to follow them down. People went even lower when third party viewers changed the height slider to measure from sole to top of head. The Linden Lab viewer still measures from sole to eye level. When I played in the early years I was 185cm[i.e. about 6 feet] by prim measure in bare feet. I was squiddy as, compared to pretty much everyone else adult human avatar then. I am still 185cm. Yet now when at shopping events I am slightly above average in height for a female avatar. This sounds right, certainly for the fashionista crowd. I think it's likely that both our perspectives are generally true --depending on the SL subculture: That is, average heights have been coming down in social circles where women predominate, while avatar heights remain largely gargantuan where male competition predominates -- think virtual nightclubs, roleplay areas, combat zones. VDRAW is a tool that can express as a virtual character's activity even casual work being done on PC. For example, if you use pen tablet for making illustrations, you can make it appear as if the virtual character himself draws illustrations... VDRAW is based on the concept that even people who do not have VR equipment can perform virtual character activities. The minimum device required for VDRAW is "mouse" and "keyboard" only. VR equipment and very high spec PC are not necessary. If it is a PC equipped with a microphone, it also supports lip sync that moves the mouth of the avatar according to the voice. Did Fragile Male Egos of Real Life Men Cause Second Life's Giant Crisis? In the last years I'm seeing more realistic sized avatars, especially at shopping events. Perhaps you should count more on women with this. I suspect the issue touches guys more, as they (usually, I don't mean everyone) don't like to appear shorter that other men, so they raise their height and so on. Of course there are also individuals affected by giantism in real life, but the whole population 8 feet tall is a tad odd. Women instead (again, in general) could feel not so comfortable in towering above everyone else, including their boyfriend. This sounds right. I vividly remember creating my first avatar, setting the height to 6 feet tall, teleporting to an event... and feeling like Kevin Hart at an NBA party. Studies consistently confirm people form an empathetic relationship with the avatar that they control, so it's easy to see how real life height standards (which tend to affect men more than women) would carry over into the virtual world, nudging many or most male users into a tallness competition. And many or most female users would then feel nudged to follow suit, so the height disparity wasn't so vast. And as average avatar height increases, monthly land costs grow, until they're unsustainable for many, and the land ownership attrition increases too. Or to put it another way: Linden Lab the company keeps losing revenue due to toxic masculinity. Just had a fascinating (if disheartening) conversation with someone I’ll call “Asami”, a long time Second Life user and Asian fashion enthusiast from Japan. While there is a substantial userbase of SL users based in Asia (roughly 5-10%, based on known stats), the overwhelming majority live in the United States and the European Union. That’s inadvertently led to a lot of misrepresentation of Asian identity and culture in Second Life avatars, and on the worse end of the problematic spectrum, Asian fetishization. By way of reference, she points to the shape above, in the Marketplace. “These look like they were made by Asian fetishists,” I note.